In 1994, shortlyafteragathering with somespiritual musicians traveling through their home town of Cleveland, OhioAcyuta Krishna, and Anthony Grecenukinfused powerfulmantras into the music of their teenage alternative rock band giving birth to "Mantra Fusion Rock". For six years they worked continuously on evolving theirmusicin thestudio,and doing live performances. During that time, they moved to Las Vegas and Seattle to bring their original project to new audiences.They held a vision to share the ancient message of India with modern music as it's vehicle. By the summer of 2003, Acyuta was magnetically drawn to Maui, Hawaii where he became next door neighbors with Jagadeesh, a well known mantra chanter in the circle of western yogis. One afternoon in their shared plantation home they discovered a forgotten cosmic connection. It turned out that Jagadeesh was one of the musicians that Acyuta and Anthony had been inspired by 10 years ago ! They retold the story of how they passionately sung mantra songs in a hotel room until the other occupants pounded on the door asking them to quit down. Wow, The inspiration of mantra music had come full circle and reunited the two of them on the most remote island on the planet. This was a clear omen that they should form a newband,now called Dust of Vraj. Late nightjam sessions onthe volcano of Haleakala exploded into a hypnotic fusion of hard rock guitars, trancing mantra vocals, programmed dance beats, and a harmonium dubbed the "space box". 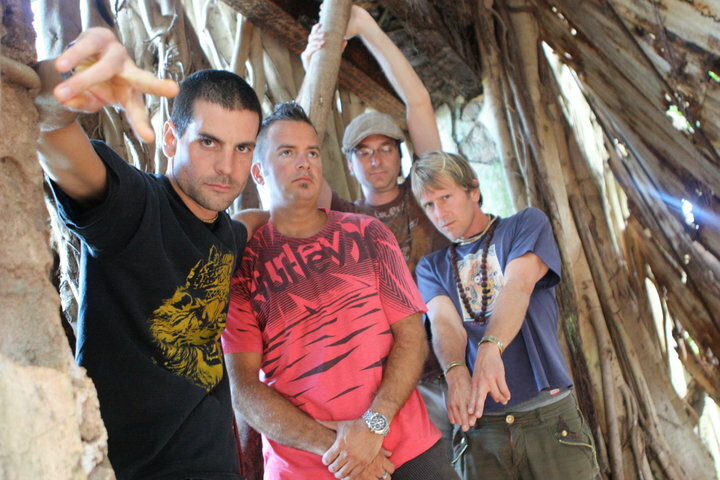 Their debut album "Lucky Six" was recorded live in a Japanese style house on the north shore of Maui. It was done in one take, with a few overdubs andthree songs were created on the spot. Dust of Vraj launched this record in Tokyo, and sold over 30,000 c.d. 's in just a few months ! The band lived on Mt. Fuji writing new material whilegaining strength indeepening their meditational practice. Shortly after a pilgrimage to India they were off to Europe performing at castles, night clubs, festivals, and even on the street ! Now thousands ofinternational c.d. sales were under their belt accompanied bya live concert video shot in Belgium. By 2009 theirdedication scored a 3 month residency at thefamed Pachyderm Studio in Cannon Falls, Minnesota,where Nirvana recorded their finalalbum"In Utero". Bassist Anthony Grecenuk and drummer Michael Drew rejoined with Acyuta and Jagadeesh during the bands recording sessions in studio "A" with engineer Aaron Shannon. The alchemy of the newly formed Dust of Vraj quickly matured as the four of them rehearsed new material for two weeks. Then they entered the studio to record eight songs during the month of April. Shortly after,female vocals, tabla, and other traditional instruments were recordedon Maui, and in Houston, using their own Remote Studio 108. Finally, the hard to find shenai, sarode, and Indian violin were overdubbed with classical masters in New Delhi, India. Sylvia Massey and Rich Veltrop Mixed the record "Time I Am" at RadioStar Studios in Weed, California. Sylvia Massey said "In over 25 years of music production I've never heard anything like this. I really love this record. Amazing !" Dust of Vraj created "A THING" which picked up the bands momentum to an unstoppable speed. Dust of Vraj is shaping a new taste amongst music lovers with an original fusion of transcendental sound mixed with popular alternative rock. The enthusiastic message the band delivers is bright and inspiring. The mantras of India are timeless; speaking directly to the soul of the attentive listener. It's asublime sound which spans all generations, and brings an ever fresh sense ofexcitement to the music world. Reaching beyond the major market's of Europe, U.S.A, and Japan; Dust of Vraj is working hard to touch the rest of the planet such as India, China, Russia, Australia, and South America. Dust of Vraj is a cultural presentation of east meets west in a style that's cutting edge. When the band was asked whats next ? Acyuta replied " We are a vessel for a sacred message that is bound to reach every corner of the planet. So I am also watching where the Great Spirit leads us next."